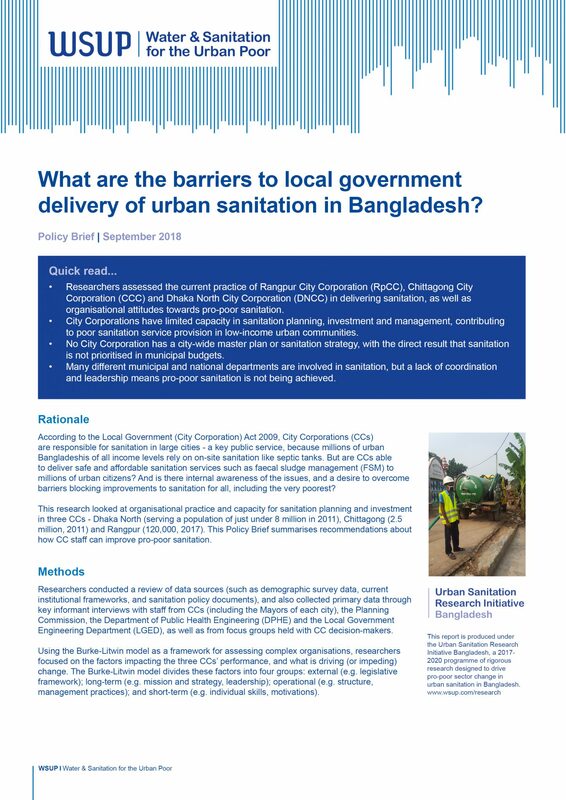 According to the Local Government (City Corporation) Act 2009, City Corporations (CCs) are responsible for sanitation in large cities – a key public service, because millions of urban Bangladeshis of all income levels rely on on-site sanitation like septic tanks. But are CCs able to deliver safe and affordable sanitation services such as faecal sludge management (FSM) to millions of urban citizens? And is there internal awareness of the issues, and a desire to overcome barriers blocking improvements to sanitation for all, including the very poorest? Researchers examined organisational practice and capacity for sanitation planning and investment in three CCs – Dhaka North (serving a population of just under 8 million in 2011), Chittagong (2.5 million, 2011) and Rangpur (120,000, 2017). This Policy Brief summarises the findings and provides recommendations about how CC staff can improve pro-poor sanitation.